Velodyne Impact-Mini review | What Hi-Fi? The compact subwoofer remains something of a curate's egg in home cinema terms: either it's not capable of enough truly deep bass to satisfy or it's ponderous and unwieldy, a legacy of its ‘quart from a pint pot' design. The Velodyne Impact-Mini occupies a carefully judged middle way. It uses two aluminium drive units: an active 16.5cm forward-firing unit, and a passive 20cm downward-firing radiator. This maximises output without inducing unwanted port noise. A 180W amplifier provides the power, ensuring the sub remains an assured, authoritative figure even in the densest action sequences. No, it can't defy physics, but with movie content, this is an effective, enjoyable listen, one able to trade blows with many larger rivals. Where it falls down, only slightly, is with music. Bass notes can become clouded, as if the Velodyne is struggling a little to contain the complexity of the track. It's never a blur of bass – it's more sophisticated and capable than that – but still, a larger sub may well serve you better here. 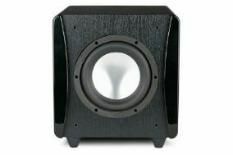 However, you might not want a larger subwoofer, and you may view any subwoofer investment purely as a home cinema purchase. If that's the case, there's much to admire here.